The best-known work of the poet and novelist Lydia Maria Child may be her poem “Over the River and through the Woods,” but she is also remembered for her compelling objections to slavery and her support for underrepresented groups. She was a tireless activist and her prolific and candid writing on non-violence and equality was well ahead of its time. That the present position of women in society is the result of physical force, is obvious enough . . . taking away rights, and condescending to grant privileges, is an old trick of the physical force principle; and with the immense majority, who only look on the surface of things, this mask effectually disguises an ugliness, which would otherwise be abhorred. Lydia Maria Child, “Woman’s Rights,” in Letters from New-York, Vol. 1 (New York: Charles S. Francis, and Boston: James Munroe, 1843), 232–240.
. . . Books addressed to young married people abound with advice to the wife, to control her temper, and never to utter wearisome complaints, or vexatious words, when the husband comes home fretful or unreasonable, from his out-of-door conflicts with the world. Would not the advice be as excellent and appropriate, if the husband were advised to conquer his fretfulness, and forbear his complaints, in consideration of his wife’s ill-health, fatiguing cares, and the thousand disheartening influences of domestic routine? In short, whatsoever can be named as loveliest, best, and most graceful in woman, would likewise be good and graceful in man. You will perhaps remind me of courage. If you use the word in its highest signification, I answer that woman, above others, has abundant need of it, in her pilgrimage; and the true woman wears it with a quiet grace. If you mean mere animal courage, that is not mentioned in the Sermon on the Mount, among those qualities which enable us to inherit the earth, or become the children of God. . . .
That the present position of women in society is the result of physical force, is obvious enough; whosoever doubts it, let her reflect why she is afraid to go out in the evening without the protection of a man. What constitutes the danger of aggression? Superior physical strength, uncontrolled by the moral sentiments. If physical strength were in complete subjection to moral influence, there would be no need of outward protection. That animal instinct and brute force now govern the world, is painfully apparent in the condition of women everywhere. . . . This sort of politeness to women is what men call gallantry; an odious word to every sensible woman, because she sees that it is merely the flimsy veil which foppery throws over sensuality, to conceal its grossness. So far is it from indicating sincere esteem and affection for women, that the profligacy of a nation may, in general, be fairly measured by its gallantry. This taking away rights, and condescending to grant privileges, is an old trick of the physical force principle; and with the immense majority, who only look on the surface of things, this mask effectually disguises an ugliness, which would otherwise be abhorred. The most inveterate slaveholders are probably those who take most pride in dressing their household servants handsomely, and who would be most ashamed to have the name of being unnecessarily cruel. And profligates, who form the lowest and most sensual estimate of women, are the very ones to treat them with an excess of outward deference. . . . The nearer society approaches to divine order, the less separation will there be in the characters, duties, and pursuits of men and women. Women will not become less gentle and graceful, but men will become more so. Women will not neglect the care and education of their children, but men will find themselves ennobled and refined by sharing those duties with them; and will receive, in return, co-operation and sympathy in the discharge of various other duties, now deemed inappropriate to women. The more women become rational companions, partners in business and in thought, as well as in affection and amusement, the more highly will men appreciate home—that blessed word, which opens to the human heart the most perfect glimpse of Heaven, and helps to carry it thither, as on an angel’s wings. . . .
A copy of Letters from New-York, Vol. 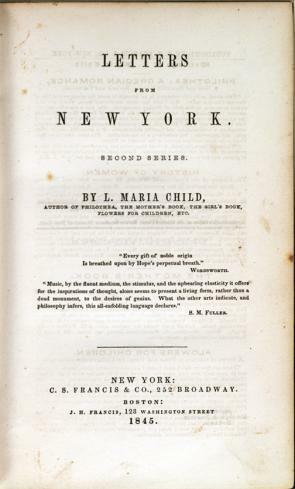 1, by Lydia Maria Child (New York and Boston, 1843), can be viewed on Google Books.